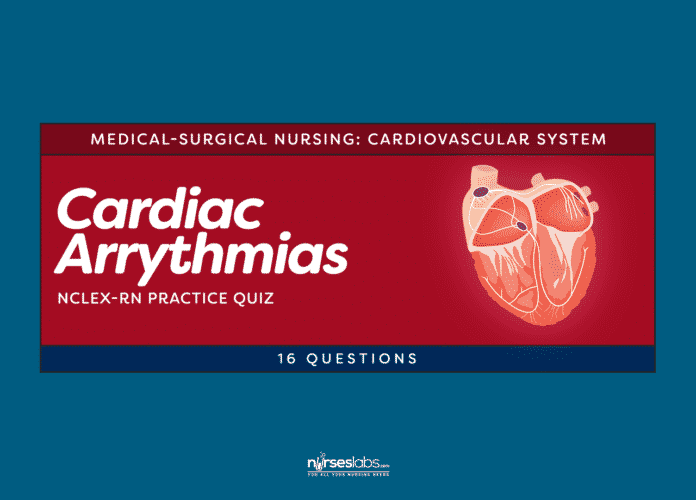 This is a 16-item NCLEX style examination about Cardiac Arrhythmias. The aim of this exam is to provide nurses and future nurses with the knowledge and skill set to competently care for patients with cardiovascular problems. EXAM TIP: To avoid errors in judgment, do not read information into questions and avoid speculating. In Exam Mode: All questions are shown, but the results, answers, and rationales (if any) will only be given after you’ve finished the quiz. You are given 1 minute per question, a total of 16 minutes for this exam. Premature ventricular contractions can cause hemodynamic compromise. The shortened ventricular filling time with the ectopic beats leads to decreased stroke volume and, if frequent enough, to decreased cardiac output. The client may be asymptomatic or may feel palpitations. PVCs can be caused by cardiac disorders or by any number of physiological stressors, such as infection, illness, surgery, or trauma, and by the intake of caffeine, alcohol, or nicotine. The consistency of the RR interval indicates regular rhythm. A normal P wave before each complex indicates the impulse originated in the SA node. The number of complexes in a 6 second strip is multiplied by 10 to approximate the heart rate; normal sinus rhythm is 60 to 100. Elevation of the ST segment is a sign of cardiac ischemia and is unrelated to the rhythm. The QRS duration should be less than 0.12 second; the PR interval should be 0.12 to 0.20 second. PVCs are often a precursor of life-threatening dysrhythmias, including ventricular tachycardia and ventricular fibrillation. An occasional PVC is not considered dangerous, but if PVCs occur at a rate greater than 5 or 6 per minute in the post MI client, the physician should be notified immediately. More than 6 PVCs per minute is considered serious and usually calls for decreasing ventricular irritability by administering medications such as lidocaine. Increasing the IV infusion rate would not decrease the number of PVCs. Increasing the oxygen concentration should not be the nurse’s first course of action; rather, the nurse should notify the physician promptly. Administering a prescribed analgesic would not decrease ventricular irritability. First-line treatment of ventricular tachycardia in a client who is hemodynamically stable is the use of anti-dysrhythmics such as amiodarone (Cordarone), lidocaine (Xylocaine), and procainamide (Pronestyl). Cardioversion also may be needed to correct the rhythm (cardioversion is recommended for stable ventricular tachycardia). Defibrillation is used with pulseless ventricular tachycardia. Epinephrine would stimulate and already excitable ventricle and is contraindicated. 1. Breathe deeply, regularly, and easily. 2. Inhale deeply and cough forcefully every 1 to 3 seconds. 2. Vagus nerve to increase the heart rate; overdriving the rhythm. 4. Widening of QRS complexes to 0.12 second or greater. 5. The QRS complex ranges from 0.12 to 0.20 second. 5. Answer: 2. Inhale deeply and cough forcefully every 1 to 3 seconds. Carotid sinus massage is one of the maneuvers used for vagal stimulation to decrease a rapid heart rate and possibly terminate a tachydysrhythmias. The others include inducing the gag reflex and asking the client to strain or bear down. Medication therapy often is needed as an adjunct to keep the rate down or maintain the normal rhythm. In complete atrioventricular block, the ventricles take over the pacemaker function in the heart but at a much slower rate than that of the SA node. As a result, there is decreased cerebral circulation, causing syncope. 13. Answer: 4. Widening of QRS complexes to 0.12 second or greater.